Begin your research on Tax Law with these prominent treatises and study aids. Examines full range of corporate tax issues, including corporate organization, capital structure, income tax, Sub-chapters C & S, dividends and distributions, foreign corporations, and foreign source income. This study aid begins by introducing students to key terminology used in federal income tax. The focus of the study aid is on introductory cases and materials, and in particular on individual income tax. The basic topics covered in the book include income, deductions, attribution of income, tax accounting, recognition of gains and losses, and capital gains and losses. This study aid is designed to provide students with a summary of topics and issues in federal income tax. It is designed in a question and answer format to give students examples of tax problems and then provide explanations to those problems. Its index includes a Table of Cases and a Table of Internal Revenue Code Sections. This study aid is designed to serve as an introduction to the U.S. federal system of taxing individuals. Topics include discussions on what is income, what is deductible, and to whom income is taxable. This study aid, from the Concise Hornbooks series, includes analysis of cases and concepts from major casebooks and provides explanation of major topics in Federal Income Tax. It also includes graphical representations and charts of concepts in Federal Income Tax. The index provides a Table of Cases, Tale of IRC sections, Table of Treasury Regulations, and Table of Revenue Rulings. This study aid is designed to supplement a traditional casebook and course in federal individual income taxation. Each chapter contains the provisions of the Internal Revenue Code relevant to that particular chapter's topic. Chapters also include summaries of leading cases and relevant administrative rulings. Five-volume treatise providing in-depth analysis of federal taxation relating to individuals, corporations, partnerships, estates, and gifts. 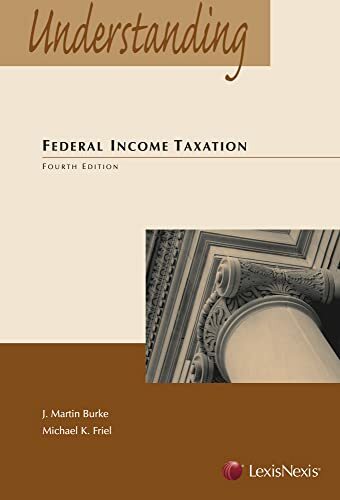 This treatise specifically covers federal income taxation of individuals by providing a concise, but complete account of the tax problems of single taxpayers, heads of households, married couples, and surviving spouses. A comprehensive practitioner-focused collection of 300 "portfolios" on a wide variety of tax issues. Written mostly by practitioners, each portfolio contains an in-depth analysis of the applicable law, practice documents, and sample forms. Portfolios are also available covering state tax issues and foreign taxes for the larger economies. This electronic version of the preeminent print treatise of the same title examines full range of corporate tax issues, including corporate organization, capital structure, income tax, Sub-chapters C & S, dividends and distributions, foreign corporations, and foreign source income. This treatise is the most commonly cited tax law treatise by the courts. It is arranged topically and is focused on using cases rather than determinations to clearly illustrate principles of tax law. It is designed to allow the explanations to be accessible through a number of research paths and includes multiple tables and indexes to find relevant information. Additionally, Volume I offers explanations of how to find information in Mertens. This is the electronic version of the print treatise of the same title, providing in-depth analysis of federal taxation relating to individuals, corporations, partnerships, estates, and gifts. This being the electronic version of the print treatise of the same title, it specifically covers federal income taxation of individuals by providing a concise, but complete account of the tax problems of single taxpayers, heads of households, married couples, and surviving spouses. Treatise examining partnership taxation under Subchapter K for partnerships and similar business structures. Authors are leading practitioners in the field. Treatise explaining and analyzing the procedures followed by the IRS to ensure tax compliance. Also covers administrative practice, including requests for letter rulings, examinations, and the appeals process. Provided via Bloomberg Law, these Bloomberg BNA Portfolios are the electronic version to the print. It is a comprehensive practitioner-focused collection of 300 "portfolios" on a wide variety of tax issues. Written mostly by practitioners, each portfolio contains an in-depth analysis of the applicable law, practice documents, and sample forms. Portfolios are also available covering state tax issues and foreign taxes for the larger economies. This electronic version of the print series of the same title is offered through Bloomberg BNA. It is a comprehensive practitioner-focused collection of 300 "portfolios" on a wide variety of tax issues. Written mostly by practitioners, each portfolio contains an in-depth analysis of the applicable law, practice documents, and sample forms. Portfolios are also available covering state tax issues and foreign taxes for the larger economies.